Left face / Right face: Abe Lincoln. A representative of Oxford University Press writes requesting permission to use this image of Abe Lincoln (one of the 44 U.S. presidents better than the current one) in a textbook entitled MYP Biology 4&5. Of course I am delighted. The image is part of a project I did about a decade ago comparing the left and right sides of people’s faces. I divided a series of face in half and showed what they would look like if both halves were like the right size versus both halves being like the left side. 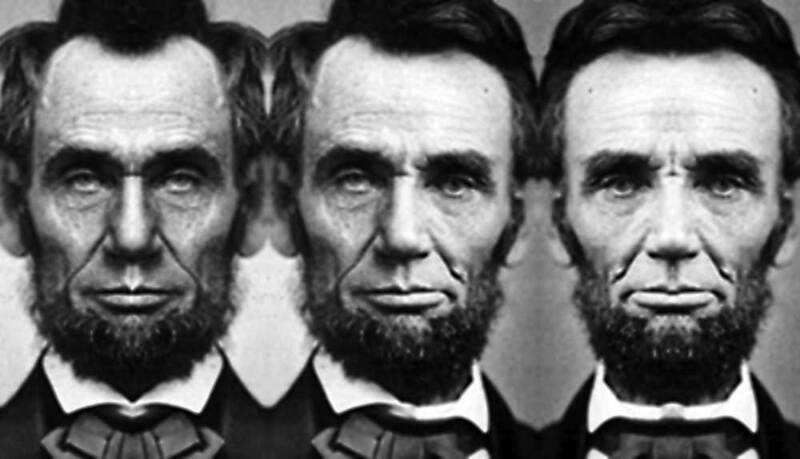 I noted when I posted this image that “Lincoln had a condition called cranial facial microsomia — the left side of his face was much smaller than the right.” Above are, left to right, two-right-face Lincoln, actual Lincoln, and two-left-face Lincoln.